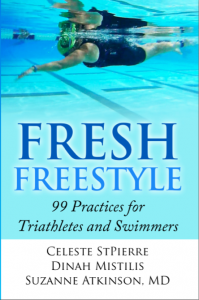 Paddles and Fins…Should I be using them during drills? Should I use paddles to help with my pulling drills?? Also should I wear fins when I am doing my kicking drills?? The above question was posted on a beginner triathlon web forum just recently. While waiting for other people to reply, I could not help but share my own thoughts based on my own experience with personal swim development as well as providing swim advice to others. That’s a big “It depends”. The use of aids in swimming changes the nature and benefit of the drill you are doing. Using paddles, for example, can help you in performing a force or strength workout, where the purpose of the drill is specifically to get stronger. More surface area requires more force production to perform the stroke. The benefit is that your shoulders/lats, etc get a better strength workout, but the downside is that it can increase the risk of injury if done excessively. Also, paddles can be used for certain types of technique workouts…if you let your hand slip or spill water, or you drop yoru elbow during your pull, this effect is magnified when you have paddles on. In this case, the paddles can help refine technique, but should then be used sparingly, say 25-50 with paddles to get an idea of the stroke areas that need work, then 25-50-100 without to practice newfound skill and repeat. You can see how this workout does not develop strength the same way that 5×100 (for example) with paddles on would help. Fins can be useful in several ways as well. One of the ways I enjoy using them is when I”m doing a new stroke drill where my speed may be too slow so that I’m sinking while doing the drill and therefore unable to concentrate on the drill because I’m underwater! An example for me was when I started doing one arm stroke drills. I was so bad at them that I was really slow and sinking. By putting fins on, my speed was up and I was staying on the surface of the water, and therfore got more benefit out of practicing the one arm drills. SO the fins were helpful not for my kick, but so that I got benefit out of a new drill. Now I am much better at the one arm drills and don’t need fins to help me get through them. Fins can help some people develop ankle flexibility. They can also help with leg/kicking strength in a similar way that paddles help with arm strength. But in triathlon, we are not really relying on kicking for speed/power production because it is an endurance event (yes, even at 250-500 yards), and we try to preserve leg strength for bike/run and try to keep HR down by not using large leg muscles on the swim if we don’t need to. One more example is using fins for people working on balance drills. By keeping speed up just a little, you can practice/experiment with horizontal balance if it is still a new skill. But ulitmately, you need to be able to swim with good technique without the use of paddles, floats or fins, so their use should be deliberate, with a purpose, and limited in your total workout. Your aim is to reproduce the benefit you get from them (balance or technique for example) without having to use the aids. The points regarding conserving leg strength and keeping HR down during the swim are debatable, and were debated on another popular triathlon site. My personal thought is that each person needs to find their own break even point between good technique, the contribution of kicking to their total swimming speed in any given triathlon distance, and their personal energy reserves. All of this will depend upon your personal background, strengths and training focus in each of the 3 sports and is something that your coach can help you sort out individually.